I am on a finishing streak which makes a nice change. I was sick on Tuesday so was unable to go to work for 48 hours. I felt much better yesterday and did attempt to go in but was sent home when I was half way there. 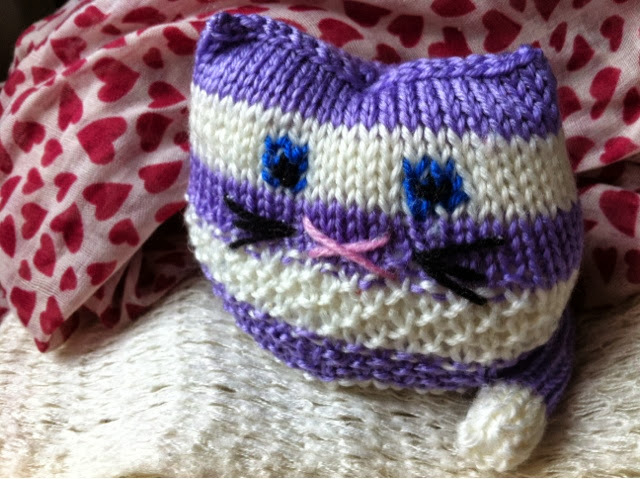 I went home and finished off an order for a toy cat. I used duplicate stitch for the eyes as it is going to a new born and I felt the combination of buttons and my sewing skills would never end well. It was my first attempt at duplicate stitch and I'm quite pleased with the results (All Hail YouTube). 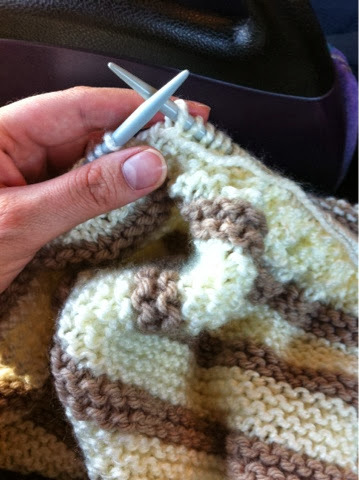 Last week I also purchased another ball of Hayfield's baby chunky in beige so I could continue with the baby blanket. I am now working on the boarder. I'm not entirely sure when I'm going to get it finished though as I'm going to Scaresville tonight (don't ask! ), its The Gentle Giant's birthday party tomorrow night, we are off on a road trip with some friends to Frome in Dorset on Saturday for an engagement party driving via Devizers, Warminster and Bath and then, on Sunday, I am being dropped in Reading, travelling to Kings Cross, meeting Mum and jumping on a train to Edinburgh. We will spend a night in the city, then on Monday, take a train and a coach and arrive in Ullapool where we will spend the week of half term in hiding. We are going to learn to play cribbage, eat lots of crumbly oat cakes, go for walks along the sea front, over indulge wherever possible and I will, of course, take lots and lots of knitting. I cannot wait.